How does the Arctic Affect Extreme Weather? Over the past several decades, the number of extreme weather events has increased. During those same years, the Arctic has warmed twice as fast as the rest of the Northern Hemisphere. The rapid Arctic warming is referred to as Arctic Amplification, and research suggests that it may be blamed for some of the extreme weather episodes. This SOS visualizations, starts by showing the minimum extent of Arctic sea ice in 1980, along with a jet stream animation, representative of the patterns in the 1980s. 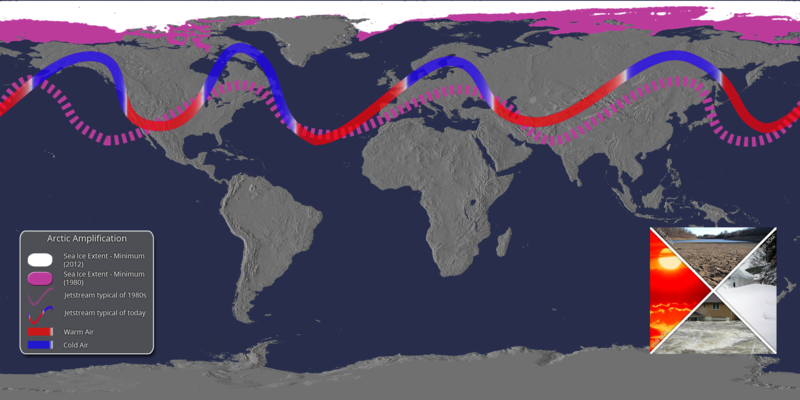 The jet stream is colored red and blue, indicating warm air and cold air movement, respectively. The visualization then transitions into showing the minimum extent of Arctic sea ice in 2012, the lowest on record, and a jet stream pattern typical of today. The 1980 ice and previous jet stream pattern are now pink for comparison. You will notice that the jet stream typical of today is more amplified and has a slower west to east progression. There is also a Picture-In-Picture (PIP) near the end of the visualization, showing four the main kinds of extreme weather associated with Arctic Amplification (Droughts, Floods, Cold Spells, and Heat Waves). The temperature differences between the cold poles and warm tropics, combined with the Earth’s rotation, cause air to flow eastward fastest over the midlatitudes, where most of us live. This is called the jet stream. Approaching North America, the jet stream moves northward over the Rocky Mountains, then dips southward forming a trough toward the East Coast, then northward as a ridge over the Atlantic Ocean. It continues in a similar long wave pattern over Europe, Asia, and the Pacific. Storms develop and track along the jet stream, pushing cold air south and warm air north. During the past few decades, general warming in the atmosphere has accelerated Arctic ice melt, leading to more seasonal ice cover which is not as white and absorbs more sunlight, in turn causing more warming. The Arctic has warmed twice as fast as the rest of the Northern Hemisphere. 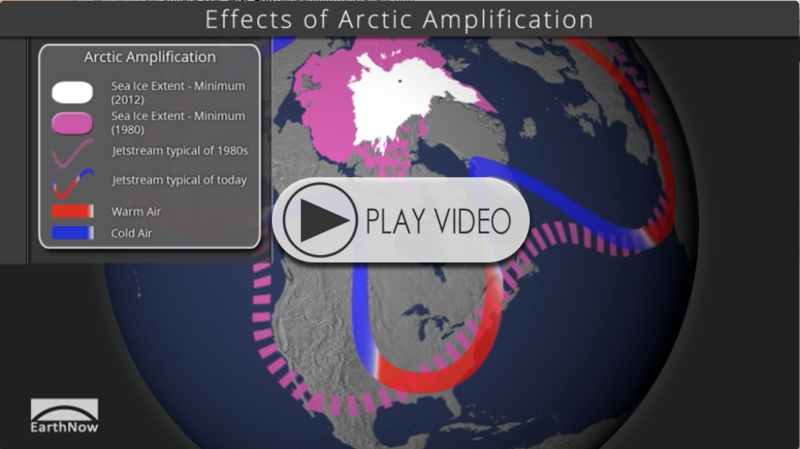 This is Arctic Amplification. Scientists have observed that the reduced temperature difference between the North Pole and tropics is associated with slower west-to-east jet stream movement and a greater north-south dip in its path. This pattern causes storms to stall and intensify, rather than move away as they normally used to do. At midlatitudes, more extreme weather results from this new pattern, including droughts, floods, colds spells, and heat waves. Where do I find the dataset? First, check your SOS system to make sure it’s not already in the EarthNow category. 2 Responses to How does the Arctic Affect Extreme Weather? Thanks for that… I normally try to give all colobars a simple label of colorbar.png. This is what happens when I neglect to do that. Everyone, take note! Thanks, Toshi!